Cáceres, C., and Hernández, R. (2019). "Balsam fir strength behavior at moisture content in service after freezing in green condition," BioRes. 14(1), 401-408. In northern countries, engineered wood products are widely used for the construction industry. Recently, a concern has been raised regarding a slow freezing rate in green wood (of the order of 1 °C / h up to 25 °C) that could greatly reduce wood strength. Thus, logs processed during winter might produce lumber with a lower mechanical strength in service than those produced during summer. Therefore, the main objective of this study was to evaluate the influence of the freezing rate on the selected mechanical properties of balsam fir (Abies balsamea [L.] Mill). Three groups of 17 planks (20 mm x 20 mm x 1200 mm) were exposed to three freezing rates (10 °C/h, 5 °C/h, 1 °C/h) and another group was kept as a control group. After the freezing treatments, the planks were stored in a conditioning room at 20 °C and 65% relative humidity to obtain an equilibrium moisture content of 14%. Samples of 10 mm x 10 mm x 190 mm and 10 mm x 10 mm x 40 mm, for static bending and parallel compression to the grain tests were then prepared, respectively. The results showed that the freezing rate did not have any effect on the mechanical strength of balsam fir wood. Sawmills in Canada store freshly harvested logs in wood yards, where they remain until they are sawn. The logs are thus exposed to seasonal changes throughout the year. Among all seasons, wood is more vulnerable during the winter because the free water of green wood freezes at temperatures below 0 °C. The historical weather data in the Quebec province reported a mean temperature variation between -30 °C to 6 °C from 1981 to 2010 (Service Info-Climat 2018). Thus, wood can undergo a temperature variation of approximately 36 degrees at variable freezing rates (depending on the local climate conditions of each year) from December through March. Below temperatures of 0 °C, a part of the moisture in wood is present in the form of ice, while another part is in a non-freezing condition. The content of non-freezing moisture in frozen wood depends on the moisture content and the sub-zero temperature (Torgovnikov 1993). If the wood has a significant quantity of free water, when the cell lumens and the gaps between the cells are almost completely filled with water, the centers of crystallization during cooling arise in the water at temperatures around –5 °C to –6 °С (Topgaard and Söderman 2002). However, the freezing process is influenced by the porosity of wood, the difference in the water properties in macroscopic and microscopic interstices, the interaction forces between the water and cell walls, and the minerals and organic substances dissolved in the water, among other factors (Torgovnikov 1993). Previous studies conducted in green frozen wood have reported that the mechanical properties of wood increase as the temperature decreases below 0 °C, and that a higher moisture content of the wood results in a greater strength increasing effect of low temperatures (Mishiro and Asano 1984; Mishiro 1990; Hernández et al. 2014). In addition, Mishiro (1990) found that repeated freezing cycles had no influence on the modulus of elasticity and bending strength for water saturated samples between a temperature range of -140 to -20 °C. Conversely, a more recent study was conducted, on wood samples conditioned to 12% equilibrium moisture content (EMC) at room temperature, on the effect of the freezing rate on Norway spruce strength; it was reported that slow freezing rates (1 °C/h) negatively affect the resulting wood strength of lumber processed in winter conditions (Szmutku et al. 2013). In fact, according to Szmutku et al. 2013, the static bending at EMC was lower for lumber processed in winter than those processed in summer. Moreover, repeated freezing and thawing due to the natural temperature variation during winter would lead to the further reduction of wood strength. From a practical point of view, these results could be a concern for the wood industry. The implication would be that the wood processed during winter would produce lumber of lower strength compared to lumber produced during the rest of the year. Thus, the aim of this study is to determine whether the freezing rate negatively affects the mechanical properties of wood, more precisely balsam fir. Balsam fir (Abies balsamea (L.) Mill.) is an important species in Canada and belongs to the spruce-pine-fir (SPF) wood group, which is widely used in construction applications and in the pulp and paper industry (Zhang and Koubaa 2008). Balsam fir was chosen within the SPF group species because of its highest green moisture content. It was hypothesized that the probable effect of freezing on the wood strength should be more apparent. Three trees of this species with a diameter of 18 cm at breast height were freshly harvested during fall of 2012 from the region of Lévis in the Quebec province. The obtained stems were straight and did not present decay. The stems were cross-cut at 15 cm from the ground to obtain 11 logs of 1.2 m length each. A total of 136 planks of 20 (R) × 20 (T) × 1200 (L) mm3 of sapwood (closest to the bark) and heartwood were obtained from the logs (Fig. 1). A sample of 20 (R) × 20 (T) × 100 (L) mm3 was obtained from each end of the plank to determine the green moisture content (MC) and basic density (BD). Afterwards, the rest of the plank was wrapped in plastic and placed inside a closed box that contained an air-humidifier to keep them at the green state. The planks were separated into 4 groups (17 samples per group) for each wood type (sapwood and heartwood). Treatments were given to each group as follows: control group at 20 °C (without freezing treatment), Group A (frozen at a rate of 10 °C/h from 20 °C to -25 °C for 4h 30 min, Group B (frozen at a rate of 5 °C/h from 20 °C to -25 °C for 9 h), and Group C (frozen at a rate of 1 °C/h from 20 °C to -25 °C for 45 h). Once the temperature of -25 °C was reached, the planks were maintained at this condition for 48 h. They were then placed in the air-conditioning room at 20 °C and 65% relative humidity, until reaching an EMC of 14%. Then, two samples for bending (10 (R) × 10 (T) × 190 (L) mm3) and another two for parallel compression to the grain (10 (R) × 10 (T) × 40 (L) mm3) tests were prepared from each plank. All of the samples had straight grain and no apparent defects. The growth rings were oriented parallel to the tangential plane of the samples. The sample distribution is shown in Fig. 1. Mechanical tests were performed on a universal testing machine (MTS Systems Corporation, Eden Prairie, MN, USA) equipped with a 5 kN load cell, following the ASTM D143-94 (2013) standard. Minor modifications were made to achieve the objectives of this work. The static bending test was performed with a three-point loading system. Both the upper support, which carries the load, and the two lower supports had a radius of 25.5 mm. The span length was 140 mm and the load was applied at a crosshead rate of 2.0 mm/min until complete failure. The modulus of elasticity (MOE) and modulus of rupture (MOR) were then calculated. For the parallel compression to the grain test, the load was applied at a rate of 1.5 mm/min until complete failure. Ultimate crushing strength in the longitudinal direction (σL) was obtained from the maximum load at failure and the cross-sectional area. In all cases, calculations were made using the cross-sectional area measured at the time of testing. The weight of each sample was taken immediately after each mechanical test to the nearest 0.001 g. Samples were then oven-dried at 103 °C during at least 48 h to obtain their oven-dry weight, measured to the nearest 0.001 g. The EMC, and density at EMC (DEMC), were calculated for each sample. The data were analyzed using the SAS 9.3 software (SAS Institute Inc., Cary, NC, USA). Raw data was first evaluated with the Box-Cox method, showing the more fitted transformation to obtain normally distributed data. The transformation was only applied when normality was not initially reached. A mixed model of analysis of variance (ANOVA) was used to evaluate the variation in MOE, MOR, and σL. The green MC, EMC, BD, and DEMC were used as covariates, keeping only the ones that were significant for each model. All analyses were performed at a confidence level of 0.01. Finally, the normality was verified with the Shapiro–Wilk’s test, and the homogeneity of variance was verified with the graphical analysis of residuals. 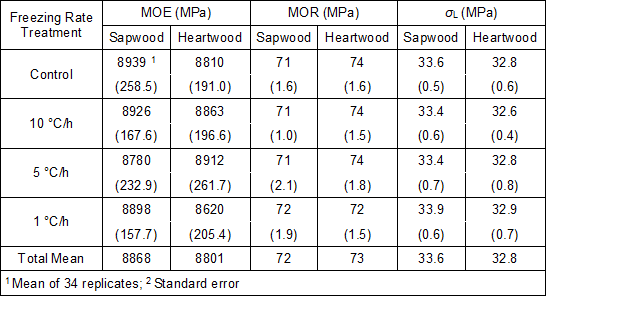 The mean values of green MC, EMC, BD, and DEMC for sapwood and heartwood are shown in Table 1. The green MC and BD were measured on each plank, while the EMC and DEMC were measured on each static bending sample and parallel compression to the grain sample. 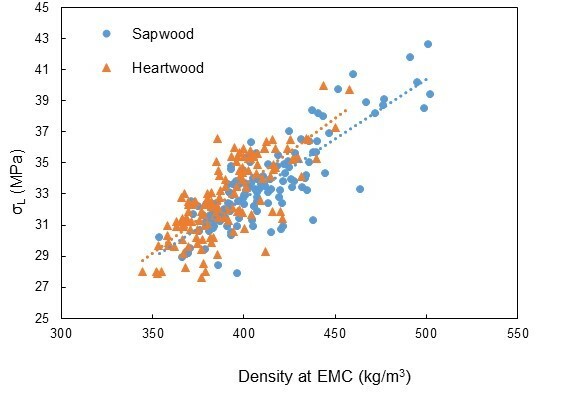 The green moisture content was 66% higher in sapwood than in heartwood, which is comparable to the green MC variation found by Hernández et al. (2014) for this wood species. The mean BD (339 kg/m3) was similar to that (335 kg/m3) reported by Jessome (1977), but lower compared to the values obtained by Hernández et al. (2014) for sapwood (351 kg/m3) and heartwood (357 kg/m3). The ANOVA showed that neither the freezing rate nor the wood type had a significant effect on the MOE or MOR. The ultimate crushing strength was not affected by the freezing rate either, but it was significantly affected by the wood type (Table 2). Hence, the MOE, MOR, and σL values were similar for all freezing treatments including the control group (Table 3). 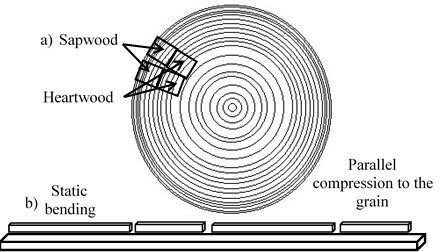 The authors’ results showed that a fast freezing rate (10 °C/h) or a slow freezing rate (1 °C/h) did not alter the wood strength in static bending nor in parallel compression to the grain. Wood is a very complex material in which cell morphology (anatomy) and chemistry are highly variable depending on numerous factors (Zobel and Van Buijtenen 1989). The wood porosity, the difference in the properties of the water in macroscopic and microscopic interstices, the interaction forces between the water and the capillary walls, and the minerals and organic substances dissolved in the water could affect the wood freezing process (Torgovnikov 1993). Hence, two hypotheses can be proposed to explain the results obtained: the absence of ice formation even at temperatures below zero and the presence of sufficient voids in the wood to allow water expansion during crystallization. First, plant response to sub-zero temperatures is initially manifested as a supercooling phenomenon in water, which is a metastable state in which water remains liquid below its freezing point, acting as a freeze avoidance mechanism (Zaragotas et al. 2016). Moreover, Kärenlampi et al. (2005) found the presence of non-freezing water in the cell wall at temperatures below zero going up to – 45 °C at a rate of 10 °C/min. This non-freezing water content is dependent upon temperature, MC, and cell wall microstructure. In contrast, a previous study reported that a slow freezing rate (1 °C/h) significantly reduced the MOR, MOE, and the compressive strength in Norway spruce (Szmutku et al. 2013). These authors believed that large ice crystals of free water could form in the cell lumen only at a slow freezing rate, causing damage in the cell wall structure, and thus reducing the wood strength. Although this hypothesis has been demonstrated in some food freezing processes (Rahman and Velez-Ruiz 2007), setting a parallel with wood freezing would not be necessarily equivalent. where the basic density of wood cell walls is taken as 1.54 (Ross 2010). Wilhelmsson et al. (2002) and Chui (1995) determined Norway spruce basic density from different provenances, at 383 kg/m3 for the former and 336 kg/m3 for the latter. These values gave a range of MCmax of 196% to 233% using the formula above. Norway spruce green MC reported by Szmutku et al. (2013) was 156%, which represents 80% and 67%, respectively, of the calculated MCmax. In other words, there is a possibility to still gain 20% and 33% of moisture, respectively. Ice has a specific gravity of 0.915 g/mL, which is approximately 9% below the corresponding value of water, reflecting the fact that water expands by approximately 9% when it enters the solid state (Zachariassen 2005). Although, it is not likely to know where the extra water will be located (cell wall or lumen), water transportation from the tiny cell wall pores into larger cavities where there is enough space for crystallization is more probable (Kärenlampi 2005). Therefore, the formation of ice crystals at 156% green MC, even considering a water expansion of 9%, would probably not cause damage in the cell wall structure. In the present study, MCmax for balsam fir was calculated as 229%, which will represent a potential moisture gain of 35% for sapwood and 64% for heartwood. A similar water transport behavior would be expected and consequently no damage to the cell wall will occur. Nevertheless, it would be interesting to conduct further testing with fully saturated specimens. Additionally, a significant effect of the covariate DEMC on all the studied mechanical properties was shown in the ANOVA. Correlations with BD were also significant, but DEMC resulted in a better predictor. This effect was more noticeable for σL, followed by the MOR, and finally by the MOE (Table 2). The ANOVA also showed an effect of the type of wood on the σL; thus the σL of heartwood was higher than that of sapwood. Therefore, correlations were separately made for heartwood and sapwood. The correlations between σL and DEMC are shown in Fig. 2. The ultimate crushing strength showed a correlation coefficient (R) of 0.76 for heartwood and 0.83 for sapwood. These results were in agreement with previous studies that reported a good relationship between σL and wood density (Hernández 2007; Cáceres et al. 2018). Balsam fir static bending properties (MOE and MOR) at a level of moisture content used in service were not affected by a previous freezing nor by the type of wood. The ultimate crushing strength in the longitudinal direction (σL) was also not affected by the freezing. Thus, the wood strength in static bending and parallel compression to the grain was comparable at a fast freezing rate (10 °C/h), slow freezing rate (1 °C/h), or without a freezing rate (control). The freezing process in wood is quite variable due to wood complexity (morphology and chemistry). The formation of ice crystals in the cell wall would not cause any damage, even at a green moisture content. All of the properties were positively affected by wood density. The correlations between the mechanical properties and the density at 14% were higher than with the basic density. On σL, this effect was more statistically significant, and it was slightly higher for sapwood than heartwood. There is not any apparent reason to believe that wood strength in service will be negatively affected by freezing exposures that occurred in the green condition. 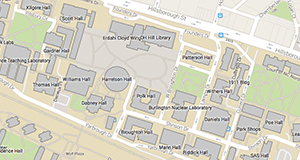 This work was supported by the Natural Sciences and Engineering Research Council of Canada. The authors thank Marie-Joël Bergeron and Angela Llavé for their valuable contribution during the laboratory experiences. ASTM D143-94 (2013). “Standard test methods for small clear specimens of timber,” ASTM International, West Conshohocken, PA.
Jessome, A. P. (1977). Strength and Related Properties of Woods Grown in Canada (Forestry Technical Report 21), Eastern Forest Prod. Lab., Ottawa, Ontario, Canada. Mishiro, A., and Asano, I. (1984). “Mechanical properties of wood at low temperatures. Effect of moisture content and temperature on the bending properties of wood. II. Moisture content beyond the fiber-saturation point,” Mokuzai Gakkaishi 30(4), 277-286. Mishiro, A. (1990). “Effect of freezing treatments on the bending properties of wood,” Bulletin of the Tokyo University Forests 82, 177-180. Rahman, M. S., and Velez-Ruiz, J. F. (2007). “Food preservation by freezing,” in: Handbook of Food Preservation, Part 4: Preservation Using Heat and Energy, M. S. Rahman (ed. ), CRC Press, Boca Raton, FL, USA, pp. 635-666. Ross, R. J. (2010). Wood Handbook—Wood as an Engineering Material (FPL-GTR-190), U.S. Department of Agriculture Forest Products Laboratory, Madison, WI. Service Info-Climat (2018). “Le climat du Québec, Normales climatiques 1981-2010 [The climate of Quebec, Climate Normals 1981-2010],” Ministère du Développement Durable, Environnement et Lutte contre les changements climatiques, (http://www.mddelcc.gouv.qc.ca/climat/normales/index.asp), Accessed 11 Sept 2018. Torgovnikov, G. (1993). Dielectric Properties of Wood and Wood-based Materials, Springer-Verlag, Berlin, Germany. Zachariassen, K. E. (2005). “Freezing and supercooling of water,” in: Water Encyclo-pedia, J. H. Lehr and J. Keeley (eds. ), John Wiley & Sons, Inc., Hoboken, NJ, USA. Zhang, S. Y., and Koubaa, A. (2008). Softwoods of Eastern Canada: Their Silvics, Characteristics, Manufacturing and End-uses, FPInnovations, Quebec, Canada. Zobel, B. J., and Van Buijtenen, J. P. (1989). Wood Variation, Its Causes and Control, Springer-Verlag, Berlin, Germany. Article submitted: Sept. 27, 2018; Peer review completed: November 11, 2018; Revised version received and accepted: November 20, 2018; Published: November 21, 2018.